The back of Elliott’s head is front and center on the screen, as men walk from behind Tyrell and take their seat at the conference table. The image forebodes revelations that will be made about the way Elliott’s mind works, later in the season. As, various men appear to be multiplying from one another around him (Matrix anyone?). From this initial perspective, Elliott is literally the head of the table. Once, all the men have taken their seat on the round table, there is a cut to a wide shot. This image shows Elliott on one end of the table and Tyrell on the other. There is a pillar that cuts the screen in such a way that Elliott’s seat at Tyrell’s table is being blocked. So, is there space for Elliott at the table, or does an immovable force separate them from one another? During this opening Tyrell provides us with a lot of exposition as he offers Elliott a job at E-Corp. We learn that since Terrance Colby took the fall for an E-Corp hack (performed by fsociety), Tyrell has been named interim CTO. “In a way it’s kinda…what’s the word in English? Serendipitous?” describes Tyrell. He also divulges that E-Corp will be soon ending their partnership with AllSafe, Elliott’s employer, which would be detrimental to the small cyber security company. Normally, exposition dumps bore viewers because it feels excessive. In this case the information is very necessary considering that the pilot episode ended with Elliott being abducted by Tyrell’s men. Now we know why Elliott was hand delivered to Tyrell and more about the plot. After Elliott declines Tyrell’s offer, orchestra music plays as Tyrell turns and walks away. In the midst of rejection, Tyrell takes a god like position and retreats back to the conference room’s windows. He looks down at the New York City streets, some thirty, or so floors separating him from the people below. Meanwhile, Elliott retreats back through the darken hallway from which he came. In the second episode, Elliott not only walks away from Tyrell, but he turns his back on fsociety too. Elliott learns that Mr Robot’s big plans involve killing a lot of innocent people, which crosses a moral line for Elliott. During the closing sequence, he returns to Coney Island to find Mr Robot sitting alone on the railing of a pier. 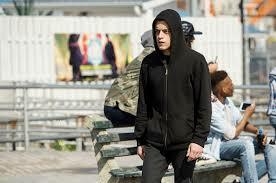 Elliott makes his way towards Mr Robot, as he walks through a group of skaters. There is no immovable object separating Elliott from Mr Robot as he makes his way to reclaim his spot in fsociety. He literally jumps up and sits right alongside his friend on the pier’s railing. Both seated high above the sandy beach below. 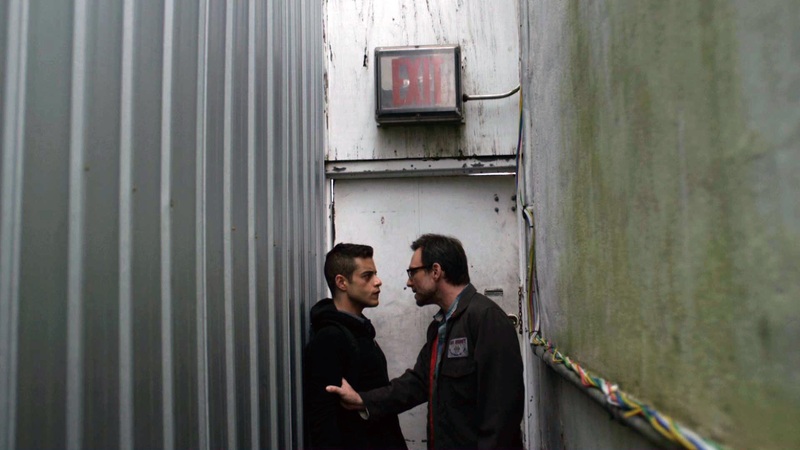 In an effort to make amends, Elliott tells Mr Robot about his father’s death. How he broke his promise that he would keep his father’s illness a secret from his mother. Sharing this story is a very vulnerable moment for Elliott, whom usually keeps to himself. Note, Elliott keeps his hood on during this entire scene, while in the opening he had it off. Hoods are often used to obscure your face from the public, a defense against being seen by people. We see just how defenseless he is at the pier, as Mr Robot pushes Elliott off the ledge. Cut to a wide shot and there is one lone, dark figure sitting on the railing. Where does Elliott belong? Are we even by his side anymore? Did you watch the finale? 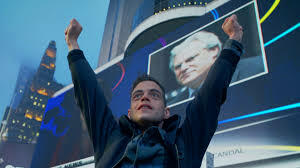 Mr Robot’s season one finale is aptly titled, zer0-day.avi, a reference to when an undisclosed and uncorrected application threatens a computer system. The vulnerability within the computer’s software can be exploited and adversely affect by additional computers and other networks. The finale’s opening scene took us back to where we began, with Elliott’s take down of Michael Hansen, I mean Lenny. Krista meets her former beau at a restaurant, where Michael attempts to talk Krista into providing information for him to use against Elliott. “This kid should not be allowed to do what he did,” explains Michael. Their conversation continues and then takes a turn after Michael discloses that all Elliott wanted was for him to leave Krista alone. The nobility behind Elliott’s action, no matter his means, allows him to remain a hero in her eyes. The Mr Robot title sequence appears on scree n right after Michael has connected Elliott to the global hack currently being covered by all the major news networks. Now that Elliott has decided to play hero for the rest of the world, is he still a noble knight, or the court jester? The fool…the madman. Elliott is a madman, as he wakes up in Tyrell’s abandoned car all alone. He has no memory of how he got there, or how many days he has been “asleep” for, or where Tyrell is at the moment. While Elliott tries to remembe r, in the background on a wall there is a graffiti mural of a man in a suit completing the heart in a I heart NY logo. The image is very reminiscent of a ringleader at a circus, one who is putting on a glorious show for the audience. Elliott heads to E-Corp, determined to find Tyrell, and he finds their offices in utter chaos, thanks to the fsociety hack. Circus music begins to play as Elliott wonders around the corridors, as he narrates each step of their master plan. Therefore alluding to the fact that he is the ringleader behind this new world…behind this circus. Elliott’s episode arc through most of the finale, is very similar to his arc in episode six-titled, v1ew-S0urce.flv. In that episode he plays a “zero-sum game” with Vera, and then discovers Shayla’s dead body, in the trunk, at the end. In retrospect Elliott knew the whole time that both of them were not going to make it out alive. Now in this episode all signs suggest that Elliott killed Tyrell, unfortunately we will have to wait until next season to know for sure. Note, that when Elliott returns to Tyrell’s abandoned car, he checks the trunk first. Elliott is the ringleader, who can’t seem to remember what he did prior to the hack. 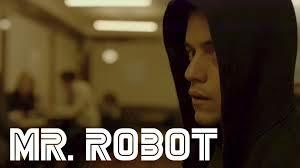 In the previous episode Elliott acknowledges that he is Mr Robot , admitting to having dissociative identity disorder. For people with this condition when they can’t remember previous events in their lives, it indicates that a different personality was in control during the time that they have forgotten. Mr. Robot finally appears just as Elliott is about to turn himself in to the officials for the hack. He explains to Elliott that they both know where Tyrell is, “So do you… you forget kiddo, I am you.” Then in an epic scene where the camera breaks from Elliott’s narrative perspective, for a brief moment, it shows him up against a wall, while choking himself, with his own hand. Yes, if this scene is an indication of anything, it’s that to the outside world Elliott is a madman…a fool. Now rewind back to the pilot, remember the scene after Elliott finds out that, with his help, fsociety has taken down E-Corp CTO Terrence Colby? He runs out into the middle of Time-Square and amongst a sea of people raises his hands in victory. Fast forward to the finale; fsociety has won and we find Elliott being carried by Mr. Robot, amongst a sea of people wearing fsociety masks, in Time Square. Mr. Robot not only was successful in making fsociety achieve their goal, but allowed Elliott not to be alone in the world anymore. Throughout the episode we see frequent cuts to TV screens, as reporters cover the fsociety hack and it’s worldwide ramifications. While , Elliott searches for Tyrell he encounters various people wearing the fsociety face mask on the New York City streets. The two argue once again, and Mr. Robot gives a great monologue about the translucent definition of reality in the 21st century. His angry rant is reminiscent of Elliott’s subconscious, one that is about everything wrong in the world, back in the pilot episode. By creating Mr. Robot and creating us, Elliott dissociates himself from his actions against fsociety. Now that in reality society is just as angry as Elliott he finds himself even more unstable then before, “I want to be alone…I n eed to be alone,” states Elliott as he closes his eyes to the outside world. The only thing that Elliott cannot separate himself from is Mr. Robot. Now aware of his own mental state, he allows his prophet to tell him what to do next. Elliott lifts up the hood of his black sweatshirt, symbolic that his alter ego has taken control, and returns home to his humble fortress. The finale concludes with Elliott opening his door to an unknown person. During the season finale, Elliott may have tentatively cracked under the pressure of being the ringleader behind fsociety and their global hack; Elliott may be a mad man but he is “no more mad than” Feste, the fool in Shakespeare’s Twelfth Night. SceneNNerd will continue to discuss Mr. Robot’s season finale during our next podcast episode. Go to iTunes to rate and subscribe. Check out our podcast episode called Hanging with Mr Robot for discussion about the season overall. See you for season two. Have you been watching Mr Robot? Are you lost in show runner, Sam Esmail’s “perfect maze”? Now you have a choice to make. Don’t finish reading this post and the story ends here, or see how far down this rabbit hole goes. Beneath this simplistic idea, lies Elliott Alderson’s complex narrative in the midst of his disillusionment with reality. At the end of episode nine, Elliott stands alongside former EvilCorp Vice CTO, Tyrell Wellick, in the fsociety arcade as Maxence Cryin’s piano cover of Where Is My Mind plays in the background. The screen fades to black as a few corn kernels burst into popcorn. The entire scene is referential to the David Fincher film, Fight Club. During the movie’s ending the narrator and Marla Singer character watch bombs go off along the city skyline; they hold hands as the world around them collapses. This ending follows the reveal that Tyler Durden was the narrator all along. In comparison the ending of episode nine concludes the complete dismantling of both Elliott Alderson’s and Tyrell Wellick’s lives…the collapse of their “perfect mazes”. Elliott works alongside the fsociety hacker crew to take down EvilCorp. 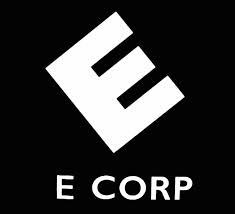 They decide to set up EvilCorp CTO, Terrence Colby as their scapegoat for a hack into EvilCorp’s financial records. Elliott’s hand in creating this vacancy in EvilCorp sets off a series of events that lead both men to standing together in a run down arcade on Coney Island. 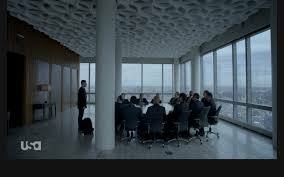 In contrast to them standing face to face in a boardroom on the top floor of a New York City skyscraper, during episode one’s ending scene and episode two’s closing scene. The third e pisode opens with the ambitious Tyrell Wellick practicing his pitch to be promoted to Evil-Corp’s CTO in front of a mirror. Again, sharp cuts are shown to overlap, one another, as Tyrell attempts to debug his self-presentation. The whole sequence presents him as a man obediently, abiding by the rules of society. His appearance of normalcy, beneath the guise of perfection, authorizes him to be viewed as a successful man in this reality. Meanwhile, Elliott attempts to adhere to the same ideology. Unfortunately, for both characters their “wrinkels” re-emerge and force them to retreat back to their own realities. This episode opens with harsh spurts of techno music as we view a look into Tyrell’s cold, disconnected world. The episode ends with classical music playing as Elliott returns to the underground, rundown, fsociety arcade. 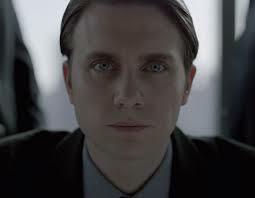 In the following episode Tyrell Wellick appears in Elliott’s apartment, siting at his desk, holding a key, as part of a dream sequence. The two characters make eye contact with one another, but don’t speak. Instead Elliott’s pet fish starts talking about his life being stuck in a glass bowl. Episode four is named da3m0ns.mp4, is this appearance of Wellick foreshadowing to a future rivalry in a later season? Remember, Tyrell appears to be holding the key referring to Mr Robot’s line indicatin g that Elliott is “the key to everything,” said earlier on in the episode. Maybe, a partnership is more on the horizon as we head into season two. Consider the idea that we only associate Tyrell as being the villain, because EvilCorp is presented as our hero’s villain. Tyrell is truly the first face we can distinguish from the crowd of EvilCorp businessmen on the show. Now throughout episodes six, seven, and eight Elliott and Tyrell don’t share any screen time together. Instead, we watch Tyrell Wellick and his wife, Joanna, attempts to take down Scott and Sharon Knowls; in order for Tyrell to assume his rightful place as EvilCorp CTO. “Tyrell. I want you to accept a hard truth. 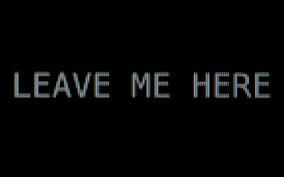 Right here, right now, in front of me. You are not going to be CTO. I want to see that look wash over your face. It’s the only way I know you’ll stop playing these silly, silly games,” explains Scott Knowls in episode six. While, Tyrell wages war in the business world; Elliott plays hero to protect Shayla from the violent criminal, Fernando Vera. After his victory at Steal Mountain, Elliott returns to his apart ment at the end of episode five to find that Vera has taken Shayla. Then he uses Shayla’s life as leverage against Elliott in an attempt to break out of prison. In a heartbreaking reveal, Elliott discovers Shayla’s lifeless body in the trunk of a car. Fast-forward to Elliott’s riveting breakdown scene with his therapist, Krista, at the end of episode seven. Tyrell Wellick did not kill Shayla, Fernando Vera did. On the other hand, Tyrell’s true evil nature is seen as he kills Sharon Knowls on a rooftop during episode seven. In response to his actions he too breakdown into tears upon his failure to keep his hands “clean”. Elliott couldn’t keep his hands clean either. Are you lost in the maze? Did you hit a dead end? Don’t worry, we are close to the source code. Are you the hero, or are you the villain? Can you be the hero in our own story, but the villain in someone else’s? Elliott is the automatic hero in this story, because he is the narrator, even our creator; remember we are his imaginary friends. He often breaks the fourth wall to talk to us and then accuses us of being co-conspirators in various attempts to destroy his reality. Our implicit trust with Elliott is broken during the ending sequence of episode eight as multiple truths are revealed. His fsociety hacker friend Darlene, is actually his sister, and the supposed leader of their group, Mr Robot, is his deceased father. I encourage fans of the sh ow to re-watch all of the scenes between Mr Robot and Elliott, pay close attention to the staging of the actors. They are constantly mirroring one another throughout; note that this episode eight is called M1rrOr1ng.qt. Reflecting one another, as a visual representation for their present relationship, as Mr Robot is a figure of Elliott’s imagination. Throughout episode nine Elliott attempts to reconcile his disillusionment of the reality that he has constructed for himself. Simultaneously, a very similar collapse of reality is taking place in Tyrell’s world. After murdering, Sharon Knowls, he has been running from the police, fired from EvilCorp, become a father, and then abandoned by his new family. This leads to a face-to-face confronta tion between Elliott and Tyrell. One wants to change the world, while the other wants to rule it. 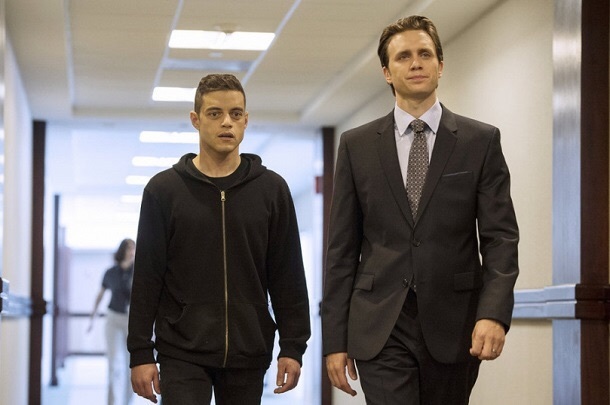 During this first installment of Mr Robot neither character is able to become who they aspire to be in society…yet.